Alright, then. Conclusions first, ramblings later. Go play Mirror’s Edge now. If you’re interested in where games are headed in the future, or are cynical about large-name studios churning out sell-out games on assembly lines, you need to play this game. This is a deeply divisive title that will infuriate as much as exhilarate, and its imperative that you experience it, flaws and all. 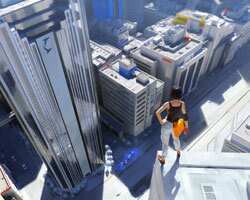 Mirror’s Edge is a first person action adventure title from Electronic Arts. Most popular first person titles, such as Half Life 2 or Far Cry, belong to a category called “shooters"—identified by a point-of-view that only shows your character’s gun. 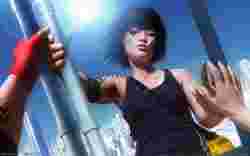 Mirror’s Edge, however, audaciously dispenses with the shooting in favour of a game centred around running and movement, exciting chases and near-escapes. Enter the Runners, an underground group of couriers who use the rooftops and alleyways to relay packages between the fringe revolutionary groups. Faith, the game’s protagonist, is one such Runner. The game opens in the backdrop of an upcoming mayoral election, where a new candidate, Robert Pope, challenges the existing leadership and promises to bring change. The game is centred around Faith’s often dangerous job. The police (called the “Blues") are perennially on the lookout for Runners, whose survival hinges on staying fast and staying out of sight. “Living on a mirror’s edge," as Faith puts it. Visually, the game is stunning—the cityscape is gleaming sharp and squeaky clean, and the sense of movement—blurry edges, rushing wind, Faith’s heavy breathing, are all picture perfect. The ambient music is never intrusive and fits in very well with the setting. The control scheme is elegant and simple—one button for all UP movements (jumping, leaping, bounding over) and another for all DOWN movements (sliding, ducking, letting go). It does take some getting used to. And you will die. Often. It’s frequently frustrating, missing the last jump in a series and plummeting to your death, and having to do the whole thing again. You’ll realize that you can’t, and indeed shouldn’t, play it like a traditional shooter—momentum is important, as is timing and balance. Running away often works better than confronting enemies. When the game is in flow, it’s absolutely wonderful, and makes other shooters feel like steering an elephant on a unicycle. But just when you’re ready to stamp a nice little 9/10 on a review score and label it “Editor’s Choice", you get to the second half of the game. 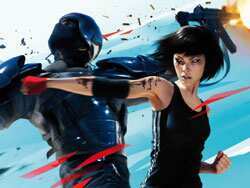 This is where Mirror’s Edge, like a lot of Bollywood movies, starts to run out of steam. Not ideas, no—the ideas carry this game through, but energy. The final set of chapters feel tired—the game seems to recycle places and situations—the seemingly same set of rooftops, the same type of confrontations and escapes, and, unfortunately, too much trial and error that ultimately trips it on its own feet. Ultimately, Mirror’s Edge feels like a great demo dragged against its will to be a full-length game. A must-play, deeply interesting demo, but never fulfilling its ambitious start. In a way, Mirror’s Edge reminded me of Bungie’s Oni—a similarly divided game featuring, yes, some very fresh and unique ideas (in that case, the wonderful hand-to-hand combat system) but let down by poor level design and a very dated execution. There’s talk of a Mirror’s Edge trilogy, and a sequel now seems all but inevitable. Personally, I can’t wait for it, but next time get us the main course along with the appetizers too, yeah?